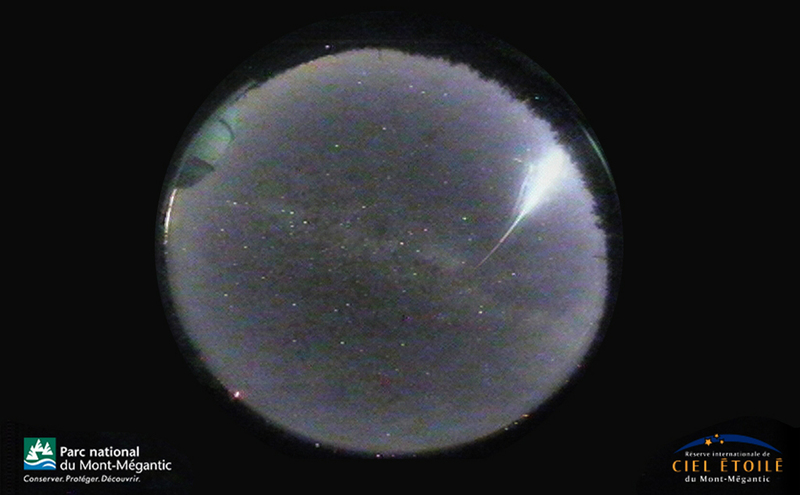 One of the all-sky cameras in the University of Western Ontario's meteor network caught this view of the bright fireball that passed over southern Quebec on Sept 21, 2016. Video presented by the Canadian Space Agency. Tuesday, September 27, 2016, 11:41 AM -	Did you see it? Western University's meteor network caught a bright fireball flashing through the sky from Sherbrooke to Montreal on Wednesday, September 21! Here's what we know. At just about 9:40 p.m. EDT on the night of Wednesday, September 21, a small space rock, likely not much bigger than a baseball, plunged into Earth's atmosphere over southern Quebec. The video above was captured from Montreal, by an all-sky camera run by the University of Western Ontario's meteor network, but the fireball was seen from hundreds of kilometres around. A superb bolide lit up the skies of southern Quebec last night around 9:40 p.m.. Luckily, our camera at the top of Mont Mégantic has caught the whole phenomenon. This phenomenon, caused by atmospheric entry of large stones, was observed in Saguenay to Montreal and Ontario, Maine, New Brunswick, in the state of New York and Massachusetts. A bolide is a meteor fireball that flashes extremely bright and then ends with an explosion as the meteoroid breaks apart, according to the American Meteor Society. According to CBC News, Sébastien Giguère, the scientific coordinator at the Mont-Mégantic ASTROLab, confirmed Thursday morning, on Radio-Canada's C'est pas trop tôt, that it was a fireball meteor. 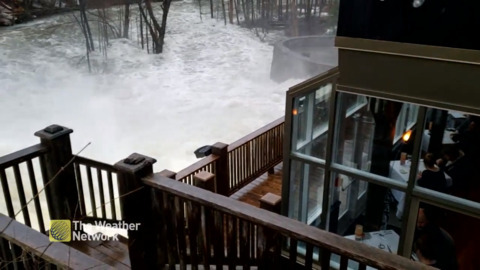 An extensive search of webcams throughout the Montreal area and the rest of southern Quebec, as well as eastern Ontario, Maine, Vermont and northeastern New York State, unfortunately turned up no other images of the event. This lack of other video evidence is partly due to the field of view of these cameras, but also the timing of their archived images. Any cameras in the area that could have caught it either did not update during the brief window the fireball was visible - sometime between 9:34 p.m. and 9:42 p.m. EDT - or the saved archive images skip that particular window. The only footage found otherwise is from the dashcam of a police cruiser in Northfield, New Hampshire, around 230 kilometres south-southeast of the meteor's track. The meteor appears much closer, almost right over the town, due to its altitude. Since the meteor is flashing through the atmosphere quite high up, probably at least 50 kilometres above the ground, but quite possibly higher, it can look quite similar to locations on the ground that are separated by hundreds of kilometres. It's only through carefully comparing the details of all the reports they've received that the American Meteor Society is able to estimate the actual location and path of the meteor. With the likely size of the meteoroid that caused this fireball, it is possible that the space rock, or at least pieces of it, may have survived to reach the ground. If so, based on its trajectory, any meteorite or meteorites that might be found would likely be somewhere northwest of Montreal. Finding those meteorites is no easy task, however. Watch for an upcoming feature on how to locate and identify these relics from space! Watch Below: The second largest meteorite on record was extracted from the ground at the Campo del Cielo in Argentina, on the weekend of September 10-11.